Starts at 8,000 feet and has been a Mammoth Tradition Since 1981. It does not matter which season you choose to visit, when it’s time to getaway Central Reservations of Mammoth is a Single Point of Contact for enjoying all of the Mammoth Mountain Resort Corridor’s Boundless Recreation and Adventure. 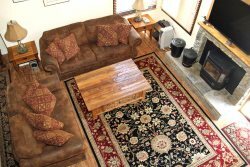 The goal of our full service Mammoth Lakes Rentals and Recreation Real Estate Company from Day One has been to help our visitors, vacation home rental guests, second home owners and real estate customers enjoy all the Mammoth Resort Corridor has to offer. We invite you to use our Guest Services as a Resource. Start with checking out road conditions at the Mammoth Junction Hwy 395 and Hwy 203. Let us know other ways we can use our experience and local area knowledge to help you fully enjoy your stay with us. Did you know when Tioga Pass is open the Yosemite National Park Entrance is only 45 minutes from Mammoth, Tuolumne Meadows is just 15 past the entrance gate and Yosemite Valley is approximately 1 hour & 15 minutes past Tuolumne. Need a ride to or from Mammoth Yosemite Airport? Let us know when making your reservation if you need assistance arranging transportation to or from the airport. Reserve your ski rentals before you arrive. Where is the best place to eat in Mammoth or Mono County? Need Spa Services or a Fishing Guide? Want to take a Pack Trip, Horseback Ride, Bike, Hike or Golf? Fall Colors, when and where is the best place to see and enjoy this spectacular and special time of year. We look forward to having you with us and finding ways to assist you with your visit. Let us know what we can do for you we look forward to finding ways to be of assistance.